The Preppy Professional: What's in my Beach Bag? I've become a pro at packing a beach bag in minutes. Living so close to the water and having summers off means lots of spur of the moment trips to the beach with friends and family. My bag is probably my favorite item out of all my beach day essentials. 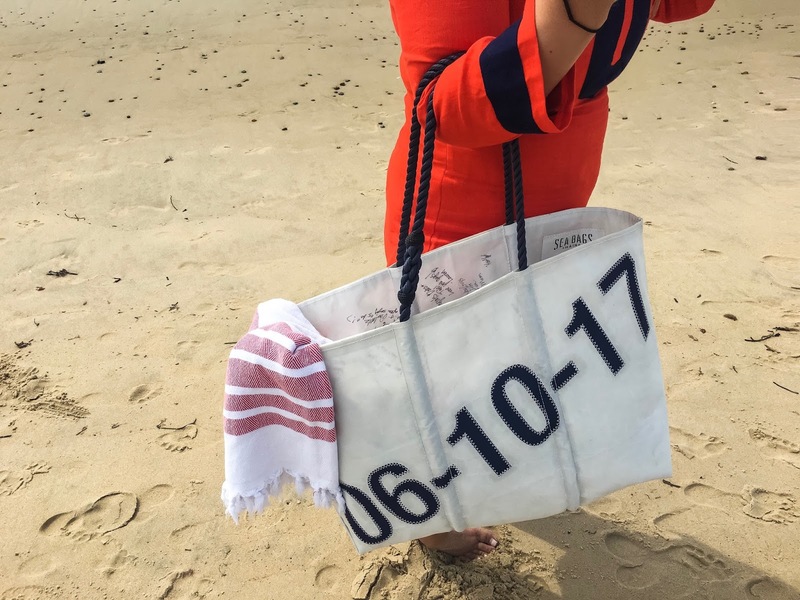 This Sea Bag tote is actually the guestbook from my wedding! If you look closely at the picture above you can see some of the well wishes from our guests. I loved the idea of having something I could use regularly rather than a book I know would eventually end up in storage. This tote is large enough to fit anything I may need throughout the day but doesn't feel bulky. Bonus, it's made of recycled sails so it is extra durable and beach resistant. I have become slightly obsessed with Turkish towels. They are fast drying and are a little more stylish than your typical beach towel. I've had both of these towels for a few years now and you would think I bought them yesterday with how well they have worn. I 100% recommend getting one the next time you contemplate buying a new beach towel. I always have several different pouches to store some of my smaller items. A larger waterproof one that contains chapstick, hair clips, deodorant, face sunscreen, mascara, etc. My second bag is usually a clutch I can use when we go for a walk or transition to dinner. I tend to keep my ID, sunglasses, and a lip gloss in here. I love this Alaina Marie clutch. It's inspired by lobster bait bags and it's the perfect nautical clutch for the beach. This tunic is also a great piece to wear over your bathing suit while getting to the beach but also is chic enough to wear for dinner and drinks after a long day of wave riding. A hat is completely necessary. I always have a baseball hat or two in my bag to make sure my face stays as protected as possible. I love this one from NRO Nantucket. Summer time lends itself perfectly to all things red, white, and blue so this hat matches all my favorite swimsuits and cover-ups. I also never wear my real pearls to the beach. Between the waves and the long walks, I would be so worried about losing my favorite earrings. Instead I wear a fake pair so I don't feel totally naked.